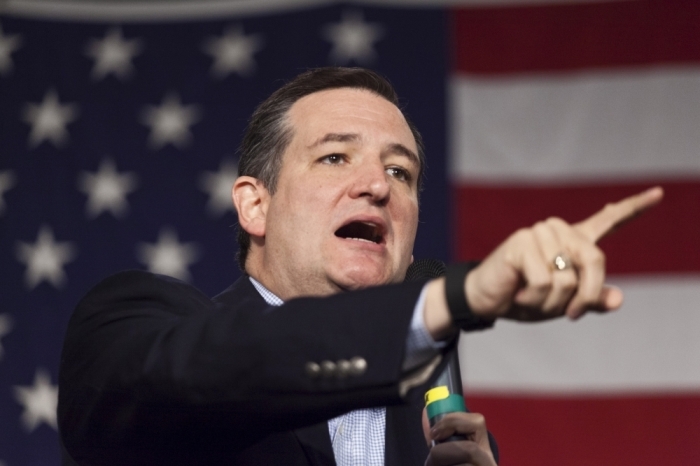 Texas Sen. Ted Cruz is the new GOP frontrunner in Iowa, according to a Monmouth University poll released Monday. Monmouth noted that Cruz's lead is the first time he has come out on top in any state polling for the 2016 election cycle. However, A CNN/ORC poll released Monday, shows Trump still leading in Iowa with 33 percent support to Cruz's 20 percent. Florida Sen. Marco Rubio polls at 17 percent and Ben Carson takes fourth place with 13 percent. No other GOP candidates received double digit support in the Monmouth poll. Thirty percent of Evangelical voters, which make up half of GOP voters in Iowa, now support Cruz. Trump is second among Evangelicals with 18 percent of the vote. Monday, Donald Trump, who is still the GOP frontrunner nationally, tweeted out his thanks to Evangelical supporters, saying, "I am especially grateful for the tremendous support I have received from the Evangelicals in the just out Iowa CNN poll. Thank you!" Cruz is also leading among voters who identify as "tea party supporters," 36 percent, and male voters, 29 percent. The Monmouth University poll has a margin of error of 4.8 percent. As Ben Carson's stock has fallen, Cruz has been able to corral most of those voters," said Patrick Murray, director of the independent Monmouth University Polling Institute in West Long Branch, NJ. "Congressman King's endorsement may not be the primary reason for this swing, but it certainly put a stamp on the Cruz surge in Iowa." Popular conservative Iowa U.S. Rep. Steve King endorsed Cruz in November. "Trump will need a huge organizational effort to get independent voters to show up in a contest where they have historically participated in small numbers. Without this dynamic, the underlying fundamentals appear to favor Cruz and Rubio," added Murray. Nearly 20 percent of GOP Iowa voters say the King endorsement does make a positive impact on who they will vote for at the caucuses. Along with other GOP candidates for president, Cruz would not join Donald Trump in saying that Muslim immigration to the U.S. should be shut down. Former Florida Governor Jeb Bush, who is polling at 6 percent in Iowa, called Trump's proposal Monday "unhinged." House Speaker Rep. Paul Ryan denounced Trump in a Tuesday press conference saying his proposal "is not conservatism and not what the party stands for." Ryan added "more importantly, this is now what the country stands for." The caucuses in Iowa are the first major election in the race for the presidency and the first opportunity to candidates to capture delegates. The 2008 Iowa Caucus helped propel President Barack Obama to victory over then perceived front-runner Hillary Clinton.